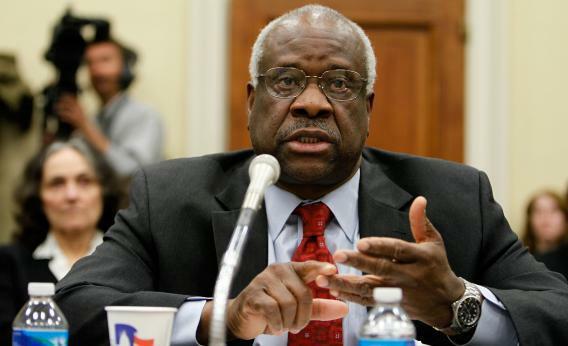 Why compare Herman Cain’s quandary to the one Clarence Thomas faced 20 years ago? What do they have in common, besides their ideologies and their race? It’s a good question. The answer: Five months ago Cain himself embraced the comparison, and said he was ready for the “high-tech lynching,” a reference to the phrase Thomas used to portray attacks on him as politically motivated and racist. The problem: Cain’s situation is nothing like Thomas’s. Start with the known facts. Cain, according to Politico’s reporting, has two harassment settlements to account for from his days at the National Restaurant Assocation – the last of them occurring 12 years ago. Thomas had to answer Anita Hill’s claims that she’d been sexually harassed when working for him at the Department of Education’s Office of Civil Rights – nine years before the hearings. Hill then went on to work for Thomas at the Equal Employment Opportunity Commission. That’s a key difference. Hill did not air her claims until Thomas was a candidate for a SCOTUS seat. Cain’s accusers made their claims and changed the courses of their careers in the 1990s. That’s the factual difference. What about politics? Thomas had no enemies to the right, because his ideological allies wanted him on the court – no exceptions. Four years after the Bork disaster, they would not let a young African-American court candidate go down. Cain has lots of enemies on the right – fellow candidates, movement diehards who think he’d lose the general election. More importantly, perhaps, is that Thomas could count on black support when he got in trouble. According to an ABC News/Washington Post poll conducted in early October 1991, after the “high-tech lynching” comments, only 50 percent of whites supported the Thomas nomination, while 70 percent of African-Americans did. According to a USA Today poll, it was 55 percent for whites, 63 percent for African-Americans. The Los Angeles Times found black support for Thomas at 61 percent, 10 points higher than support among whites, and rising. Cain can’t count on black support. He’s not a black man up for a powerful job – he’s a black man who would be competing for that job against Barack Obama. Polling has found that Cain’s about as unpopular with black voters as any Republican candidate. Thomas needed to win 51 votes from senators who, in some cases, represented large numbers of black voters. Cain has to win a Republican nomination, a process that relatively few black voters participate in. Far more Republican voters are white conservatives who like Cain because they don’t think he plays the race card. Even though he hinted at the “lynching” defense months ago, Cain has not yet played that card. He might play it today at the National Press Club. Its effectiveness will be limited, though, and lucky for him, supporters are demo-ing new lines of defense. When Herman Cain left his radio show in Georgia, RedState’s Erick Erickson took it over. He was out early last night with an analysis of the candidate’s new problems – an “oppo dump” that Erickson cheekily linked to race. “Hours after the Politico’s Roger Simon accused the GOP of being racist, the Politico begins a sincere effort to destroy the black guy running to be the GOP’s Presidential nominee.” Relevant! The rest of the take, from a CNN contributor who is very influential in how the movement looks at horse race politics, was more cautious. [W]ho ratted out the information is far less consequential than if it was true. We’re going to see a few things happen I suspect.